A great lightweight, three-season backpacker's tent: tight for three, roomy for two, light, easy to pitch, plenty of headroom, dual side entrances with vestibules big enough for gear storage but not cooking or large dogs. Sticky zippers are one drawback. 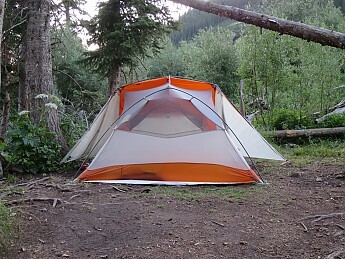 This is my third review of a Big Agnes (BA) Copper Spur (CS) series tent. In 2016 I posted a reviewed the CS UL2, now called the CS UL2 Classic, and last January I reviewed the Copper Hotel HV UL2, supplied to me courtesy of BA via the Trailspace Review Corps. Although BA has introduced the CS HV UL3, as of this writing the older model is still available as the CS UL3 Classic. In the spirit of full disclosure, let me admit that I have grown rather fond of CS tents. In general I think that they do an admirable job of solving the complex equation representing the unavoidable tradeoffs between weight, durability, weather-worthiness, floor and vestibule space, and interior volume. In this review, I will make some comparisons to these other CS models and to what I know of the newer Copper Spur HV UL3. My wife and I decided to spring for a Copper Spur UL3 (Classic) for our hike in the Wind Rivers in 2016, when we thought we might have to sit out some afternoon thunderstorms. During our 25-day hike on the John Muir Trail in 2014, we had found the two-person version a little too small for that situation, and we figured we could handle the extra 400 grams for our 10 (planned) days in the Windies. As it turns out, the one afternoon/evening where we had rain we were in Pinedale, getting my wife some new shoes, but this tent is now our favorite and over the last couple of years has seen a lot of action on various weekenders and some longer hikes, including some rainy and frosty nights. As is often the case with nominally two-person tents, the various CS2 models have barely enough floor space for two 20" wide mattresses, making “tight for two, roomy for one”, and the same goes for the three-person models: two’s company, three’s a crowd. I could see having one of our kids in there with us when they were smaller, but would be reluctant to share this tent with two other adults. The steep pole architecture and walls of CS tents gives them a lot of volume and sit-up room compared to other tents in the same class. Until we had it in hand, one thing that I didn’t appreciate about the CS3 as compared to the 2 is s that it is symmetrical lengthwise. There is no need for color coding of the poles or for rotating the fly into the right position—both can be flipped 180˚ with respect to the tent body and each other. The double-wishbone poles are the same length at both ends, and the spreader pole goes right in the middle, so there’s the same amount of headroom at both ends of the tent. I think it could accommodate four people sitting cross-legged for a rainy afternoon round of poker or cribbage (although I myself don’t last long sitting cross-legged). I don’t think the is true of the newer CS HV UL3. The new, longitudinally asymmetrical pole architecture gives more headroom at the foot end in the HV2 models, but doesn’t give as much of an advantage over the Classic in the 3-person version. The new pole architecture is wider at shoulder height and may be somewhat more stable in wind, however. With just a single hubbed pole and short spreader pole and clips rather than sleeves, all CS tents are easy to pitch, the Classic 3 a bit more so because of the four-way symmetry. Without the need to figure out which end goes where, you could just about do it by feel in utter darkness. The his-and-hers dual side entrances are another favorite feature of CS tents. The triangular vestibules provide enough space for stashing wet gear and shoes but not for cooking or taking wet gear off before entering the tent, which I suppose is why BA offers the Hotel version. In my review of the Hotel 2 I noted that its best and highest use might be for getting a wet dog out of the rain without said dog getting into your lap—the same would apply here. On clear nights we like to fold the fly back for some rain-ready star gazing. The spreader pole and vestibule pegs keep the fly otherwise tight and tidy, and it is even possible to pull it over and clip it down without getting out of the tent. There are vents at both ends of the fly, allowing for some through ventilation that is lacking in the single-vent CS2 models (the Hotel adds a vent over the vestibule), but some condensation is inevitable. During a heavy thunderstorm on a recent hike in Colorado, we were pitched on a slight sidehill and some runoff flowed under the tent floor, resulting in some condensation under our mattresses, but the fly performed as it should. My biggest gripe about the HV versus Classic models is that, in the newer model, BA decided to carve away some weight by taking the mosquito netting all the way to the bathtub floor at the foot end, allowing for more penetration of wind and whatever it carries—rain, snow, grit—something we experienced directly in our test of the Copper Hotel 2. In the Classic models, the rip-stop fabric goes up to about two feet all the way around, something I don’t mind paying a weight penalty for. Like our former president, BA seems to have a zipper problem, but in their case it’s sticky zippers that often require a second hand to pull against, especially where the tent body transitions from ripstop to netting. I suppose this is a side effect of lightweight zippers, but it exists in all three of our CS tents. After camping in sandy and sometimes windy conditions along the Colorado and Paria rivers, the zippers were sometimes opening up behind the slider, something we eventually fixed with a thorough cleaning and by pinching the sliders (always a risky proposition) where needed. I have to wonder if BA can find a smoother, more reliable zipper in the same weight class. All CS tents have the same high quality materials and construction, including taped seams on floor and fly. The HV models have lighter materials in both poles and fabric without (one hopes) compromising durability. Inevitably, the lightweight coated ripstop floor and fly are more fragile than if they were made of heavier materials. So far we have a taped-over rip in the fly of our CS3 and one on the sidewall of the bathtub floor in the CS3. We use a footprint when we can afford the weight. For a while we switched in MSR pegs, but the BA channel pegs are significantly lighter and surprisingly tough. I’ve been beating them into some hard desert soils of late and I’ve haven’t bent one yet. If I were trying to choose between the Classic 3 and the HV 3 in their current incarnations, I would save $50, take on the extra 200 g and go with the Classic, mainly because I want a wind barrier all the way around as noted above. If BA ever upgrades the HV on that one feature, then I might well decide to go the other way. None of these are four season tents, but faced with prolonged inclement weather or with a large dog, the calculus would shift towards the Hotels—which one would depend on space vs. weight needs and constraints. We get that kind of weather in Norway, and plan to take on a new pup soon, whereupon the Hotel 2 may get more of a workout. For now, the CS UL3 Classic is the first one out of the cave for short- to medium-distance backpacking trips and even car camping. Great review and info, BigRed! Nice BR. This looks like a good choice if I ever decide to lighten our 3P tent, but my wife has converted to a hammock recently due to back problems so for the rare tent trip I'll probably lug along our old 6 pounder. I have a BA Fly Creek 2 and my wife and I tried it on a backpacking trip. We fit but it's good that we really like one another. 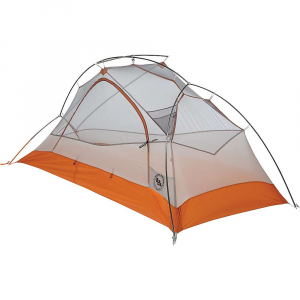 We wanted more room and not a lot of weight in a quality tent so we got the BA Copper Spur UL 3. So far we like it a lot, with one small quibble that will be outlined below. As mentioned we got this tent so that my wife and I would have more room than we had in my Fly Creek 2. This tent provides room in spades. We love it. We've used it in good weather and lousy in various wilderness areas up and down the Cascades in Oregon and Washington as well as an October trip in the high Sierra (east side) out of Bishop, California. When we first set it up we had a slight struggle with the cross-pole at the top. Once we figured it out, no problem. This tent is a cinch to set up and stake down. Everything fits and works as I'd expected. The stuff sack fits the parts well. I fold then roll my tent and fly before stuffing it but I think that stuffers will have no problem either. Inside it's roomy and airy. We can sit up side by side or even facing one another side to side. There's no condensation, though on one cold, wet morning there was a little. But pretty much everything, inside and outside, was soggy. When it rains the very tight fly causes rain to crackle and bounce away. Always makes me smile. The only snow it's been in was a very light fluff. Not really a test. There's a lot of netting on the tent body. This leads to air flowing through the tent even when the fly is tight and near to the ground. Even in her Feathered Friends super bag my wife complains of that air flow. It doesn't bother me at all. So we have that small sheet of ripstop that I clip across the netting at the head end of the tent. It helps her but it likely unnecessary for 99% of us. Mike, I just saw this review. It's very informative. Glad you like your wife! 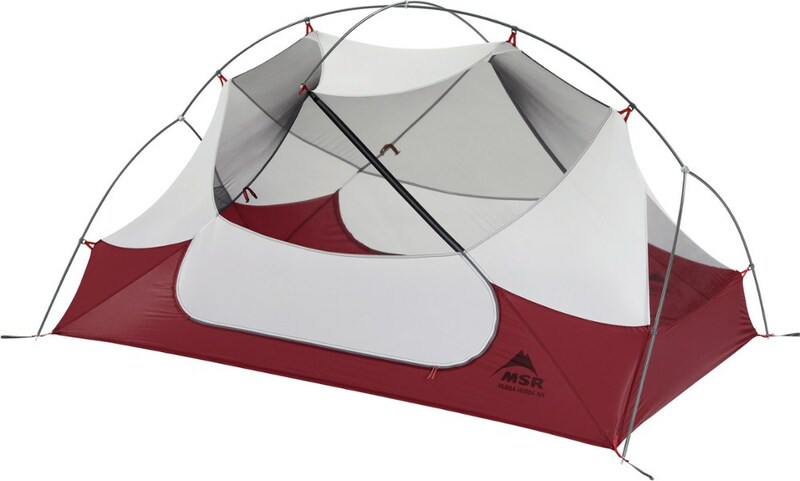 A great roomy tent for two people, and all your gear can be put inside with you. Sharing the weight between two means the tent is light enough if used when comfort and lots of room is the primary requirement. Used this tent in many locations, including La Cloche Silhouette Trail, West Coast Trail, Mount Assiniboine Park in Alberta, Canada, and in Iceland. Handles all types of three-season weather conditions, including some snow, extreme winds, and lots and lots of rain. This tent is easy to set up. It's very stable in all three-season weather conditions. I've never had any moisture issues in any weather conditions, and I've been in some severe wind and rain, some snow, hail, and sleet conditions. Condensation has never been an issue as the tent's outer shell is set back from the inner shell enough to keep it away from you. There is lots and lots of room for two people, and all the gear inside the tent itself. That saves the vestibules for your hiking boots and camp shoes with lots of space to exit and enter the tent from. The tent packs up tightly leaving lots of room in my 75 or 65 litre packs for everything else required for week long backpacking hikes. I've had this tent now for several years, and have not had any issues with tears or damage to any components yet. In fact everything appears to be in very good shape. I do use a footprimt made for the tent though, which of course adds some weight but also protects the floor from possible damage. The storage areas inside the tent are plenty, and I also bought a gear loft adding to the various places to put my tent essentials. The gear loft adds very little weight to the tent. I've used the tent with three adults a few times, and we still had no issues with room. However I still personally prefer three-person tents for two people, two-person tents for one person, and four-person tents for three, just because it provides me with the comfort I like when backpacking. Welcome to Trailspace, Brad. Thanks for your helpful BA tent review. Got any pictures of your tent setup you could share in your review? Best tent on the market! I've had this tent now for a year, so figured it was time to write a review. I've used this tent on tons of backpacking trips, in pretty much all weather conditions except snow. When properly staked out, this tent is bombproof. Wind/rain are not a problem at all. It also breathes really well, so condensation is never an issue. I use it as a solo tent because it's so light but have also had another person in it with me with lots of room left over. I figure it could sleep three average sized humans comfortably, and the twin doors and vestibules are awesome for easy access, day or night. Super easy to set up, take down and stow. As I said above, the tent is super light on the trail and can easily be distributed between two with no idea it's even in your pack. I carry it solo. I never notice the weight because I pack out around 30-35 lbs with all gear, including food. If anything, you can't help but not notice an orange stuff sack in your pack but you'll never feel the weight unless you'rr a minimalist. Fantastic tent from a fantastic company. 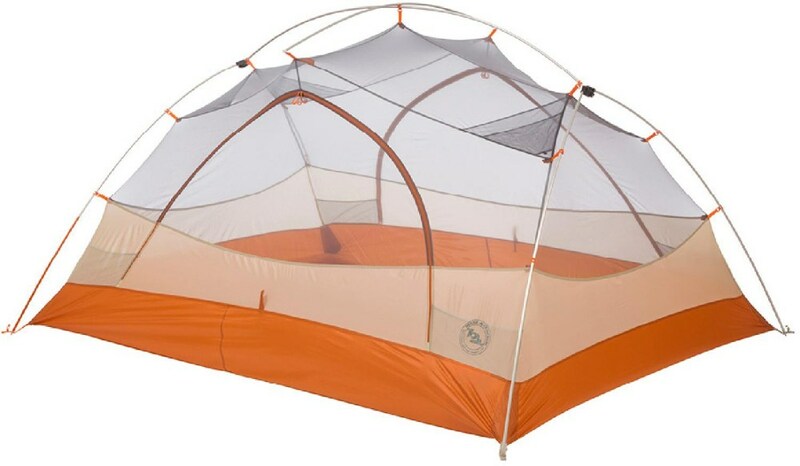 This tent is cool for backpacking, especially if you go with others who will share it and share the load. It is super easy to set up and take down, though a little difficult to fit everything back into the bag. However I would only buy this for the purpose of backpacking with others to share the load cause it is UL and so sort of fragile. It is really well ventilated and the design is otherwise great. Welcome to Trailspace, Karre. Thanks for sharing some info on your BA tent. Do you have any pictures of yours you could show others in your review? Thanks! This tent is surprisingly light and sets up like a dream! Just as important as setup is how easy it is to break down. I also love how spacious this tent is. You can easily have four people sitting in it on a rainy day and play cards! The Big Agnes Copper Spur 3 is super easy to set up. They have everything color coded so there is no mistakes! This thing sets up in five minutes at the most and takes down just as quick. It has two doors for easy exit and entry so you aren't climbing over the other person. There are two vestibules which makes it great for keeping shoes/boots or gear. The ventilation is fantastic and I have not had a problem with condensation. I am amazed with the amount of room inside the tent. There is plenty of room for gear to stay inside the tent and there is enough headroom for me to change my clothes. I am so impressed with how this tent packs back up. It actually breaks down to the size it was when it came to me!There is an overhead storage pocket for lighting or whatever you want and there are also storage pockets on the sides for your personal electronics or whatever you decide. Welcome to Trailspace, Sarah! 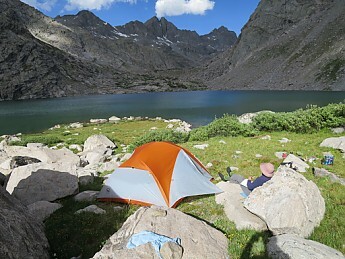 Thanks for the review of your Big Agnes tent. If you have any pictures of your setup, those would be great to see in your review too. Thanks! Very nice lightweight tent that keeps you dry in bad rain. All around comfortable tent. Have had this tent for a couple of years now. Love it.. Very easy to set up. Great to pack weighing less than 3 pounds on the trail... packs small. Only complaint would be the floor. Seems a bit flimsy and not very thick. 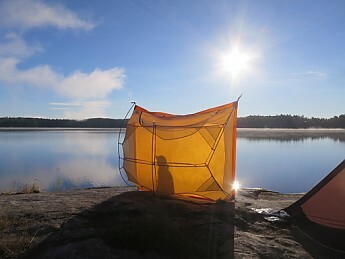 The new version of this tent contains lights built into the lining of the tent. I would have really liked that but you can add them in a kit. We have used this for mostly summer and warm area backpacking. And the other complaint would be that the doors are more upside down U, so you need to open it up to slide out of the door allowing bugs to get in. One other thing, it's not cheap, but you pay for less. This is such a well engineered tent that is so lightweight for a 3-person—and that's what you pay for. Thanks for sharing your Copper Spur review, Scott. An awesome ultralight 3-person tent with easy setup and great packability. This tent would be perfect for multi-person (2-3 person) backpacking trips, or even a *short* solo backpacking trip in a pinch. 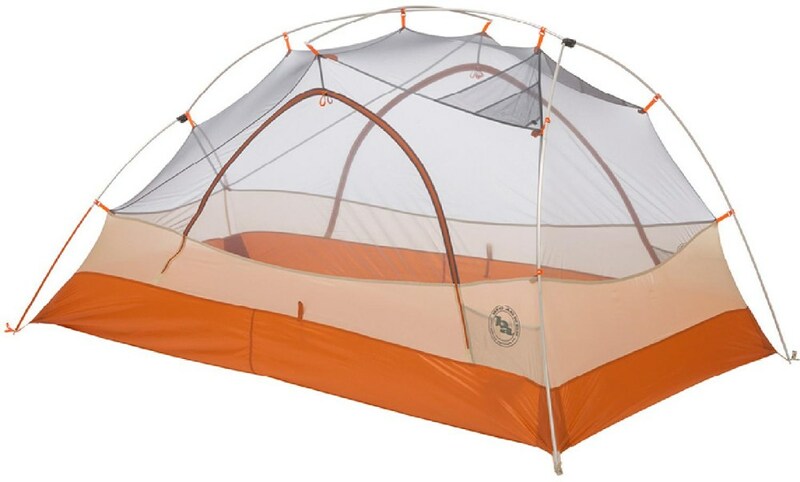 I was attracted to this tent as a lightweight double-wall free-standing option for backpacking that would comfortably fit my 6'4" boyfriend (who uses a 25" wide sleeping pad) and my 5'10" frame (I use a 20" sleeping pad). 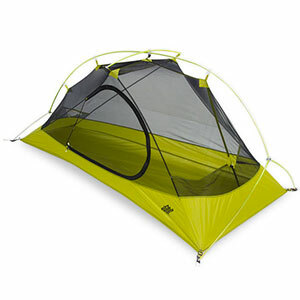 I initially purchased the Big Agnes Fly Creek UL3, but decided to exchange it after setting it up in my living room due to the fact that the quoted Fly Creek UL3 dimensions were smaller in reality (both length and width, although it was not staked out) in addition to the fact that the single door option with the rain fly design sans vents did not seem ideal. While a little heavier than the Fly Creek UL3, I'm not a gram counter and the double doors, spacious size, and better designed rain fly with vents are worth it to me. When split between two people, the weight of this tent (including the footprint) is barely noticeable (to me). Split between three, it would be really lightweight! Also notable, but perhaps unexpected, is that the tent packs down nicely. With the tent poles stored separately, it can be packed into a space that occupies about half the tent storage bag it comes with. The tent is very thin due to its ultralight nature, but does seem durable. Note, I did purchase the Big Agnes footprint to match the tent to help extend its life. My initial impression of the tent's performance is very favorable. It was extremely easy to set up the first time (less than five minutes!). While I've only used it once (so far) on a short backpacking trip in Opal Creek Ancient Forest, the tent provided good ventilation with no condensation inside the tent with the fly on. There were lots of hand pockets to stash gear in. All in all, I am very pleased with this tent and look forward to using it on many adventures to come. I got the tent for a good price during a Labor Day Sale! Cheers! Welcome to Trailspace, CoCo Kitty. Thanks for sharing your Big Agnes review. I hope you'll keep us posted on how your Copper Spur continues to perform. This is a great tent! It is surprisingly lightweight given how spacious and well-vented it is. Two exits with two vestibules allow plenty of storage and ease of entry/exit. Condensation and rain tend to drip down the edge of the rain fly into the tent. I got this tent for backpacking with my 9 and 12 y.o. sons. Though I wanted the space for three people, I didn't want to carry a massive tent. The Copper Spur UL3 really has absolutely no compromises for the usage that I've intended for it. 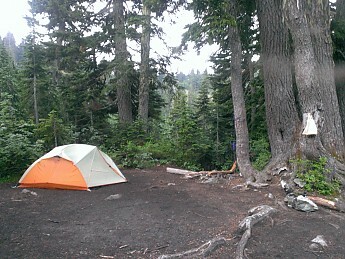 Usage & Conditions: I've used the tent for about six backpacking trips totaling about 16 days. Typical usage has been dry summer conditions in the Pacific Northwest. Setup: Setup is super easy with clips to attach the tent body to the poles. My two kids can do it without my help. Stability: It does pitch tautly and is relatively stable, though not a winter tent by any means. Weather Resistance: The only issue with moisture that I've experienced so far is that condensation or rain tends to drip down the rainfly opening above the vestibule. Ventilation: The tent vents well and condensation is typically not an issue. Vents in the rainfly that can be propped open definitely help airflow. Room & Storage: These is a great amount of floor space and headroom in this tent. It would be a good size even for 4 adults to sit inside to play cards. Packability: It packs down surprisingly small. This likely due to the thin, but high quality, tent body and fly materials. Ease of Use: Yes, all parts feel high quality and durable. Features: Y-joint poles allow super fast setup. Openable rainfly vents help ventilation. 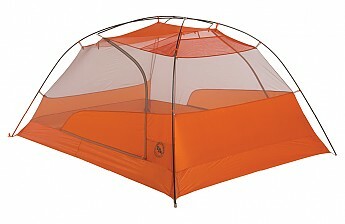 Construction & Durability: No issues with the tent construction or materials so far. Thanks for the review, Spectre. 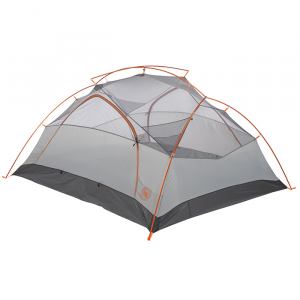 Extremely lightweight for such a roomy and comfortable tent. Excellent durability, really easy and fast pitching. I used my Big Agnes Copper Spur Ul3 while backpacking and camping through Europe for three months. I was moving a lot so I was pitching and unpitching it every two days or so. I was amazed every time about how practical this tent is that makes pitching and unpitching it so easy and fast. It was so lightweight that I never regretted the money I paid as I was carrying it on my back for the entire summer and it was worth its money for being so extremely light. Despite its light weight and small packing volume, it is so roomy that I didn't feel sad at all on rainy days while staying in my tent and playing cards with one or even two more people. It is tall enough and roomy. The tent will sleep two people with great comfort and there will still be room for gear and backpacks inside the tent. The fly offered me great help during rainy days as it is possible to pitch the fly and poles first and then shelter underneath and go on pitching the rest of your tent while being protected from the rain under the tents fly. I used this tent from up the amazing beloved Norway and all the way down to sandy warm Greece so I got to see how it works to multiple climates. Never had a complain. Great water resistance, ever through the long never ending water pourings of Germany's back forest. Great protection from the cold wind at some cold nights in North Scaninavia. And yet, good ventilation and ease at the warm sunny Spanish Granada and a shady cool shelter for the Greek sunny beaches. I used the fly alone as a beach shelter for shade several times. So thin and lightweight and yet so shady and water resistant. 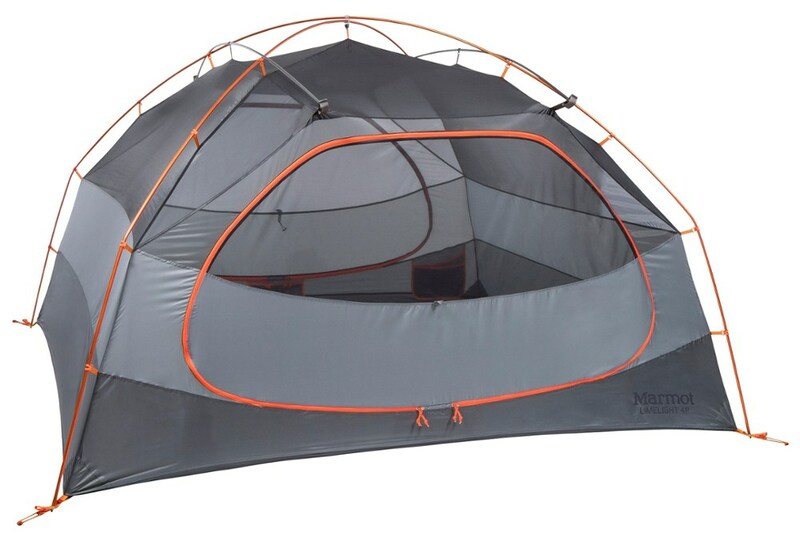 Overall it is an amazing tent, a great product. It has become my favourite piece of gear and even when car camping I would prefer my Big Agnes over my Coleman Trailblazer 5 just because it is so practical and makes it all so easy and definitely prefer it over my 5 kg Eureka K2 XT as it is almost as roomy and offers the same comfort with half the packing size and way more lighter. I would suggest to use an extra lightweight fly like Kelty Noah's Tarp just to protect this baby from birds or trees staining the tents fly. Would definitely recommend this to a friend. Best gear I even owned. Stella, welcome to Trailspace! Reading your review makes me want to quit my job and go hike through Europe! Thanks for posting it. Light and easy to set up w/ lots of room inside. My only beef is the tent opening doesn't match up with the rain fly making it awkward to climb in and out of. And I kind of wish they used a the dry entry/exit design. The rain fly has soaked my arm every morning I've used it. This tent exceeded our expectations. At 7200' we experienced a hail and rain storm that left 4" of hail that gathered at the bottom of our tent and we did not get a single leak. The vestibules are big enough to protect our large packs and our boots. The tent is extremely easy to put up and the quality is outstanding. To all this add the lightest carry weight we've ever had and you see why we feel that this is the best tent we have ever owned and used. 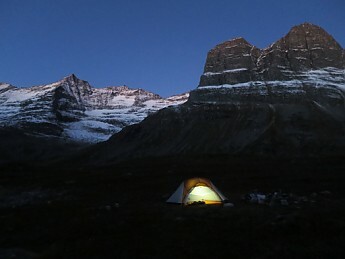 We used this tent in the Pasayten Wilderness with confidence and highly recommend it. Thanks, Big Agnes! This tent is awesome! Had to replace the old 2 person walrus that is about 10 years old so the cost wasn't an issue as I take care of my gear. It actually weighs less than the tent it replaced! The full packed weight by my digital scale puts it at 4lbs 8oz. And that's perfect for us. The floorspace is great, room enough for 3 average people. I am not a minimalist so a tarp was out of the question. This light weight could be used by 2 people with no extra bulk issues to pack as it packs down small with its ultra light fabric. The tent hub/pole system can be a little bulky unless you collapse it perfect. The foot print is a must in any hard or rocky areas and it doesn't add much weight. 5oz I believe. Still a 5lb 3 man 3 season tent. Great tent. Needed a tent that could handle 3 people backpacking. had done a lot of backpacking years ago as a teen, Now have two boys soon to be teens and wanted to get them some backpacking experience now that they have been camping since born. While tight, it does work for 3 people, but must have 20 inch pads, no larger. Have used it 4 times to date, all in Florida, ranging from hot, to rainy, to a very windy trip. The tent handled it all very well. The set up is easy, the tent is obviously very light for a 3 person tent. 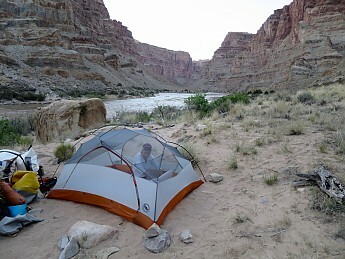 The last trip had winds over 30 mph coming right against the tent off the river, there was no shelter from it. Staked it and used the guy lines and had no problem throughout the night. Only issue is limited airflow/ventilation when fly is completely set up, even with the fly vents opened; it can get warm inside. This is a positive issue on a cold night, after years camping in a large Eureka family tent with my wife and kids, this tent is at least 10 degrees warmer on a cold night than the large one. Easy to pack and seems very strong so far. No relationship to company, really impressed with product. Really great tent. Weight is very low, space is high, and it's a snap to set up. Lots of space inside for two and doable for three. Plenty of ventilation and, on a clear night with low light pollution, is that mesh roof nice! The tent came seam sealed and we put it to the test in the North Maine Woods. Through a three hour deluge at Allagash lake the tent remained almost perfectly dry inside, with only meager dampness inside the fly due to the sheer force of the rain. Haven't experienced any condensation problems. Haven't subjected it to high winds yet (i.e. 30 knots+), but the material and pole setup appear to have quite a bit of strength. I'd be comfortable giving it a go. Overall very happy and would recommend this tent for any weight conscious, backpacking couple with the money to burn.